We create framed DVDs of favourite movies and films.......Frame that favourite DVD and cover with a personalised engraved plaque to make a unique and original gift for a special occasion. Ideal for weddings, birthdays and anniversaries. As it's a bespoke product, delivery normally takes 5 to 7 days. 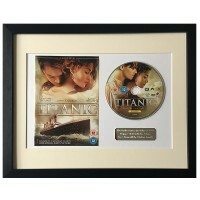 We create framed DVDs of favourite movies and films.......Framed and mounted DVD + cove..